Unless President Obama rolls into your town on the reg, you probably don't have to deal with traffic being shut down for motorcades that often. Unfortunately for residents of our nation's capital, that's a pretty regular occurrence, and the mayor has had enough! Local daily newspaper The Washington Post reports that D.C. Mayor Vincent C. Gray wants the Secret Service to review how it handles street closures after the city was "paralyzed by traffic" thanks to motorcades for foreign dignitaries over the past few days. He says prolonged closures near the White House and convention center have been "a show of disrespect to D.C. residents." "I appreciate that important dignitaries visiting the nation's capital and the White House must be afforded every courtesy and protections available by the United States government and local jurisdictions," Gray wrote. He said in the letter that the closure of 14th Street creates "gridlock in and around the area that will cause tremendous inconvenience to tens of thousands of District workers and visitors especially during rush hour. To treat the District with such disrespect is simply unacceptable." Listen: I treat actually driving in the D.C. city limits like going to war. You only do it when you absolutely have to, you keep it as short as possible, and you expect that something terrible is going to happen anyway. Traffic here is horrible enough on a good day without motorcades, so I feel Mayor Gray on this one. So what if foreign dignitary visits are just a fact of life for the capital of a nation? 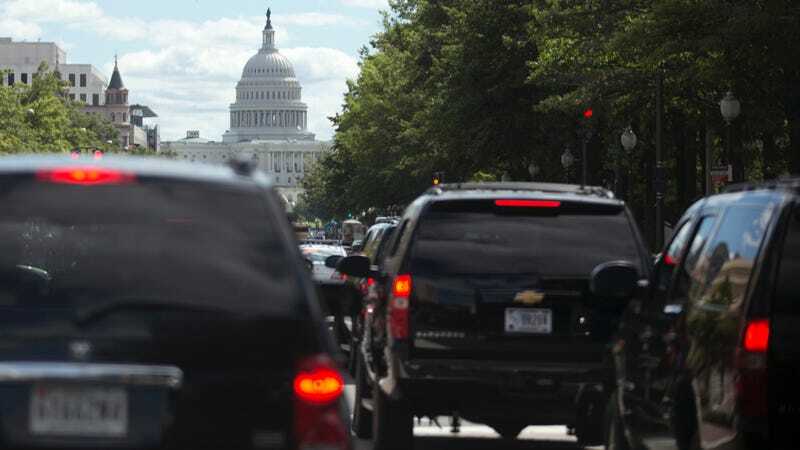 I think it's high time we make these jokers get around same as the rest of us: parked on the Beltway for hours at a time, barely moving an inch in the afternoons on Constitution Avenue, or using our sad excuse for a subway system. Next time try using Skype to talk to the president, you fancy castle-owning jokers.